AE AUR (AE Aurigae). As Mu Columbae speeds to the south away from Orion's Trapezium, from where it was hurled (rather from near where, since the Trapezium was not yet born), AE Aurigae (in Auriga, the Charioteer) zips away to the north (perhaps in myth drawn by the speeding Chariot? ), the two separating at some 200 kilometers per second. The idea is that around two million years ago two massive binary stars collided close to where the Trapezium now finds itself in the middle of Orion's Sword. 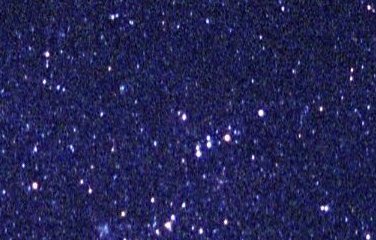 Two stars were exchanged to make the odd eccentric double Iota Orionis, while the other two were ejected to create the classic "runaway stars." At sixth magnitude (nominally 5.96), near the limit of naked-eye visibility and rather lost among a clutch of nearby stars, AE is not very impressive. The runaway star AE Aurigae lies at the center of the image in the heart of Auriga's Milky Way, up and to the left of the string of stars made by 14, 16, 17, 18 and 19 Aur. AE and 17 Aur (an eclipsing binary better known as AR Aur) are both located on the Anticenter Page. The open cluster Messier 38 lies near the lower left edge. The two-letter name implies variability, and indeed the star does vary between magnitudes 5.4 and 6.1. The apparent faintness is a product of great distance (near 1450 light years, just a bit farther than Mu Col), and a significant amount of absorption by interstellar dust, which if it were not there would make AE Aur 0.8 magnitudes brighter, boosting it to mid-fifth. Not surprisingly, Mu Col and AE Aur are similar, both class O (O9.5) hydrogen-fusing dwarfs, AE's temperature measured at 36,500 Kelvin (anomalously high for its class; 33,000 might be better). In either case, the star is very luminous, between 26,000 and 33,000 times the luminosity of the Sun (depending on the temperature and the allowance for ultraviolet radiation) and massive (at least 17 times solar, greater than Mu Col's mass) with a radius about 5 times that of the Sun. A rather slow rotation speed of under 40 km/s implies that the rotation pole is more or less pointed at us. Like the Pleiades in Taurus, AE is now passing through an unrelated interstellar cloud of gas and dust that it is illuminating (a chunk of which was apparently mistaken for a companion star). Hot stars, with their simple spectra, make ideal backgrounds for the study of the spectra of intervening interstellar gases (which are superimposed on the stellar spectra), and AE is no exception. Indeed its very high speed across the line of sight of 90 km/s relative to the Sun allows the fine structure of the interstellar medium to be probed as the star passes in back of the wispy gasses, causing the interstellar spectrum to vary. There is really nothing all that unusual in such stars; some 15 percent of O and B stars are runaways, some caused by binary interchange, others -- like Zeta Ophiuchi -- caused by one of the stars of a binary exploding off-center and ejecting the other. AE's fate is to explode as well...but as a single star which will someday be no more but for a lonely neutron star left behind. Added note: The 5.4-6.1 variation comes to us from a paper written in 1926 describing visual observations, made direcly by eye through the telescope, and appears now to be sprious. Hipparcos data suggest a variation of but a few hundredths of a magnitude with a 214 day period, but other observations indicate that result to be spurious as well. Written by Jim Kaler, 1/14/04, amended 8/1/11 Return to STARS.